"I have trouble keeping track of my marriages," Michael Levin (ex-Jack, 1975-89) admits. "I was married four times. I mean, I have four Marys whom I was married to! Mary kept changing on me - until they finally killed her. And then it was pretty good." "My favorite storyline had to be the cooking classes with Sheila," says Ilene Kristen (ex-Delia, 1975-78, 1982-83, 1986-89). When Delia was having an affair with Roger, she told everybody that she was going to cooking classes with Sheila." kitchen like her husband, Frank thought. 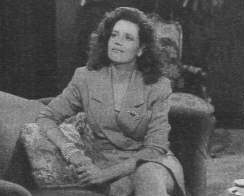 "My favorite storyline was the triangle with Jill and Frank," reminisces John Gabriel (ex-Seneca, 1975-85, 1988-89). "They wrote some good scenes - it was in the first few years of the show - and everybody was fresh and enthusiastic and loved what they were doing." Jillian (Nancy Addison Altman) got cozy. 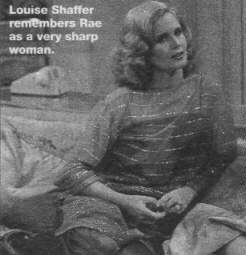 "Watching the show was torture for me because my hair was like a helmet," confides Louise Shaffer (ex-Rae, 1977-84) of her RH run. "It was a lethal weapon! I had curls that could slash skin." Rae as a very sharp woman. "I don't remember my storylines at all because I was doing them and not watching them," Felicity LaFortune (ex-Leigh, 1983-85, 1988-89) laughs. "But when I watched the show before I was on it, I loved Delia's storylines because she was so crazy. She was so clearly wrong." Leigh, but she loved to watch Delia. "Tiso Novotny," Levin says when asked about his favorite storyline. "Jack be nimble, Jack be quick, Jack killed Tiso with a candlestick. That was very exciting." with a candlestick in New York City. "Roger was pond slime," quips Ron Hale (ex-Roger, 1975-89; Mike, GENERAL HOSPITAL), "but a charming and brilliant neurosurgeon. Neurosurgery saved him. Every time they would take him to a point where he would be a scumbag, he'd save somebody's life. I remember Helen Gallagher [ex-Maeve] would always say something like, 'Oh that Roger; he's such a rotten ... but he's a damn fine surgeon.' 'Damn fine surgeon' - every time I heard that, I knew I was safe for another year." Altman) medical skills were his saving grace. Years after their respective RH stints, Felicity LaFortune ran into Christian Slater, who played D.J. in 1985. 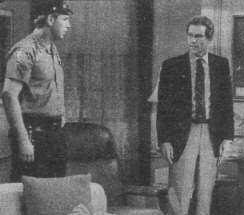 By that time, Slater was on Hollywood's A-list. But it seems LaFortune hadn't seen his movies. "He came up to me and said, 'Do you remember me?' And I said, 'What? Who? What?' He said, "You don't remember me from RYAN'S HOPE?' And I said, 'No, I'm sorry.' Then, a couple of months later, I saw the name Christian Slater, and I saw this big movie poster with his face on it. I said, 'That can't be the same kid.' It was the same kid!"